Home Pet Accessories Cool Fish Bowls – A Hotel for Fish? Cool Fish Bowls – A Hotel for Fish? If you are looking at cool fish bowls, this Fish Hotel by Teddy Luong has to catch your eye. 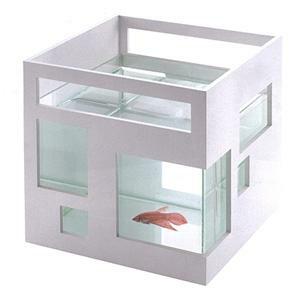 The contemporary architectural design, makes not only for a fitting home for your fish, it also means that this fish bowl will look great as part of a modern, stylish design scheme. You can also stack these bowls to give you a multi storey fish condominium and to maximize the use of your space. This mini aquarium features a square glass bowl encased in a sleek, paintable, white plastic exterior with cut out windows. If at any time you decide you just want to have a square glass bowl, with the facade, that is not a problem as the facade is easy to remove. I notice that some people have a problem with the fact that this bowl does not have a cover/lid but as someone said “my fish don’t jump”. I am with those that reviewed this product, saying they bought it just for decoration – they don’t have fish. I don’t have fish either and I still want one. It can be used in so many different ways whether as a vase or a bowl for your keys – for me it is a case of any excuse to get my hands on one of these cool fish bowls. The Umbra Fish Hotel is currently (at time of writing) available at 15% discount right here.